As a major tourist destination, visitors to Conneaut Lake would have been given competitive options by the local hotels. Since the construction of the Conneaut Lake House in 1823, more than 40 hotels have existed in the area. Beyond just room and board, most hotels offered luxury services to both guests and locals. Many contained barber shops, restaurants and ice cream parlors, and offered boat rentals. In the 1940’s and 50’s, The Lake Breeze Hotel was a popular site for Saturday night square dances. Rooms were offered at The Ramsey House for as little as $1.50/day. On the east side of the lake, however, were two of the most popular hotels: the Midway Hotel and the Oakland Beach Hotel. 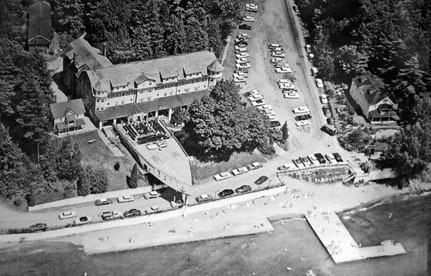 The Oakland Beach Hotel was positioned on the water, across the lake from Exposition Park (later Conneaut Lake Park). The original building, built in 1873, was destroyed by a fire in 1915. When it was rebuilt in 1930, a large dock that had the appearance of the bow of a boat extended from the hotel out over the water. Underneath the deck was a bowling alley and a taproom for evening entertainment. During the day, guests would rent boats and swim at Oakland Beach, or enjoy the hotel’s nature gardens, which boasted over 32 different species of trees. The Midway Hotel, built in 1885, originally had only 35 guest rooms, but was expanded until it had more than 70 rooms in total at the time of its closure in 1967. 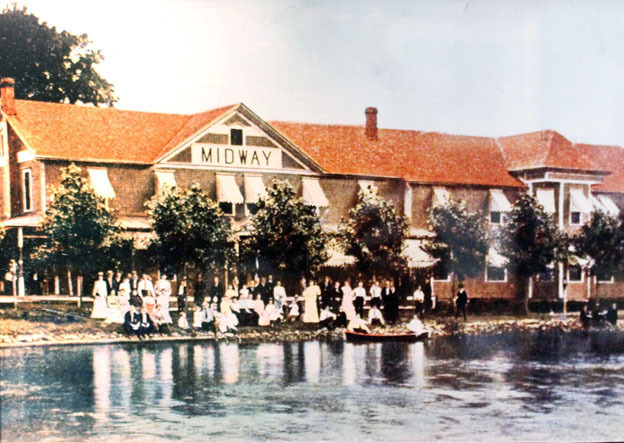 Like the Oakland Beach Hotel, the Midway was located right on the lakefront and had its own dock, around which many larger boats could be seen, including the Iroquois, the Elnora, and the Century Coronado, which, reaching speeds of up to 60 miles per hour, was the fastest boat on the lake. 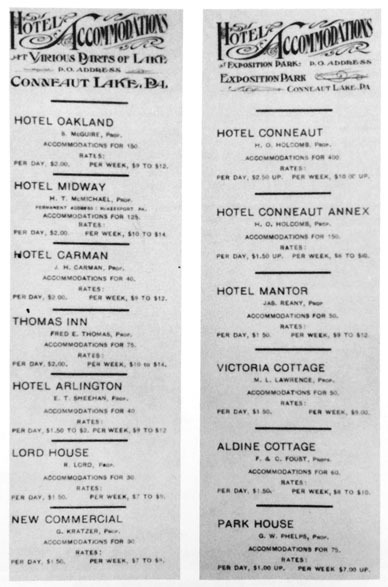 Unable to accommodate the rising costs of operation in the 1960’s (namely the tap-in and annual usage fees for the new sewage system), many hotels closed down, including the Midway and the Oakland Beach. During a time when the country was looking forward, many saw the hotels as nostalgic antiquities - reminders of the past, not beacons for the future. The few hotels that remained into the 1970’s slowly closed their doors forever until the Hotel Iroquois, the last hotel in existence in Conneaut Borough, burned down in 1978. The last remaining hotel in the Conneaut Lake area is the Hotel Conneaut, adjacent to Conneaut Lake Park. Originally a massive structure boasting 300 rooms, a fire in 1943 reduced this number by half. Though all other hotels have been replaced by motels which offer few of the luxuries of their predecessors, the Hotel Conneaut continues the Lake’s tradition as a resort town. The Conneaut Lake Our Town Team, “Hotels,” NW PA Heritage, accessed April 26, 2019, http://nwpaheritage.org/items/show/24.